Info "Good steering and aim will help you win the race." Mach Rider is one of 9-Volt's microgames in WarioWare: Twisted! It is set in the NES game of the same name. 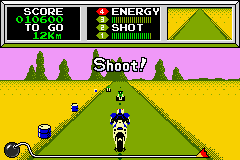 The player must shoot at enemy bikers in order to win. Level 1: The road is straight, with two targets. Level 2: There is one turn near the beginning. Level 3: Nothing but turns, and three bikers must be shot. This page was last edited on September 20, 2018, at 09:00.